A classic New Orleans dish with smoky Andouille, spicy beans and rice. A meal that sticks to your ribs and fills you up. 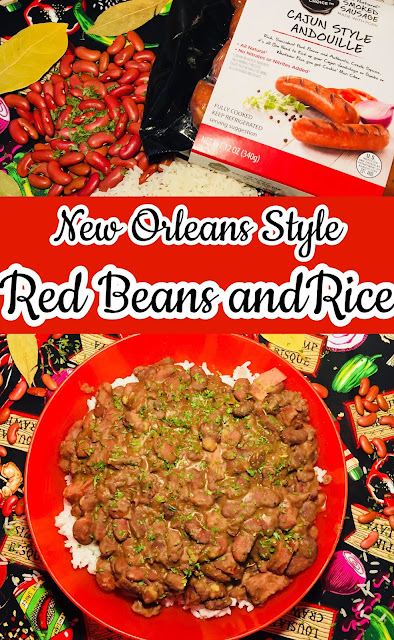 Red beans and rice is a Creole/Cajun dish that is traditional served on a Monday using soaked red kidney beans, Andouille sausage, Cajun spices and served over a bed of fluffy rice. Growing up this is one dish that I really loved, they served this and jambalaya during the week and normally they would serve this on Monday. Why do we serve red beans on Mondays? Mondays used to be the traditional “wash day” of the week. Traditionally, women of the house would put on a pot of red beans to cook all day while they tended to the laundry. The beans were largely seasoned by the leftover hambone from the previous night’s dinner. Andouille, an-Doo-ee, sausage is smoked spicy sausage that is used in Cajun/Creole dishes. To me, Andouille is the best sausage out there it has a great combination of those flavors. Where I live they sell 'hot links' or andouille at local gas stations or even grocery stores. 1. Sort beans to get any of the bad beans out. Pour into a lined slow cooker, add bay leaves and pour enough water to cover the beans. It depends on the size of your crock pot in the amount of water. It'll be about 5 cups of water. 2. Let red beans soak for 8 to 12 hours. 3. The beans will absorb most of the water, add 3 or 4 cups of water, ham hock and creole seasoning. Turn on the slow cooker on high to 4 to 5 hours or low for 6 to 7 hours. Stir occasional. 4. Chop and add andouille sausage to the beans at least an hour before serving over a bed of cooked rice. Garnish with parsley. 1. Sort beans then add to medium-large stock pot. Add bay leaves and enough water to cover beans. 3. The beans will absorb most of the water, add 3 to 4 cups of water, ham hock and creole seasoning. Bring it to a boil then lower to a simmer for 2 to 2 1/2 hours. Stir occasional. 4. Chop and add andouille sausage to the beans at least an hour before serving on a bed of cooked rice. Garnish with parsley. This looks really yummy! Rice is always a go-to meal for me, and these beans look so incredibly delicious! Red beans and rice is a family classic for us in our household. It's delicious! I went to New Orleans and the food was off the charts. Would love to go back. I love beans! Especially Lima and black beans. I definitely need new ideas for how to prepare them. Great post! This looks like something my sister would love as she travels to New Orleans very often! I'll have to send it to her. I absolutely love the story about how this dish came to be. Thanks for educating me! I am a big fan of beans. They are a great source of protein and other nutrients. I think I can make a vegan version of this! Looks great! This looks like a fun new recipe to try. We love bean dishes. Now I am having a serious craving for some great New Orleans food! Gahh, this would hit the spot today! Thanks for the great recipe! It looks yummy! It is also a dish we eat in my country Cameroon. This recipe looks really good. I love the flavors in Andouille sausage but I've never had it with red beans and rice. Will definitely have to try! The history behind why these beans were usually served on Mondays is so interesting! I've never heard that before. I love Andouille sausage and bet it's so delicious with the red beans and rice. I love this kind of food, it's not just that it's tasty but I really like the textures of everything together too. Nothing like spicy beans with sausage and then served with rice just perfection. I need a bowl. This dish is very popular in India too..we have rice with red kidney beans almost every other day...your recipe sounds really good will try it! I would love to go to New Orleans for the food alone. This sounds delicoius and would be the perfect side dish to many meals. I love red beans and rice and I used to eat it all the time when I was a kid. These days I still love it but I don't eat pork so I usually make it with smoked spicy sausages. This sounds so yum! I love red beans and often make a curry style with rice.. Saving this for later so I can try something new. Red Beans and rice is one of our favourite meal for the family.love the variation here tk give a try to it. I just made thus dish a few days ago! So delicious and flavorful! I like that I can make a vegetarian version of red beans by skipping a couple of ingredients. It looks delicious in pictures. That is such a comforting and hearty dish. Your recipe sounds yummy and mouth-watering. I love bean and rice dishes! In fact, I just ate a bean and rice dish for dinner that my mom likes to make.! I love hearty, stick-too-your-ribs kinds of meals The flavors in this are spot on, my husband would love this! Red beans are healthy and delicious with all the flavors you are added here. I love making curry with beans. We love beans in this house so I definitely will have to try this out! Sounds like such a tasty side dish...total comfort food! NOLA knows how to have a good time and how to feed its people!! All the food is good and full of comfort. The beans and rice are right up there with all of their delicious food. This recipe reminds me so much of my granddaddy's version. I bet yours is just as tasty! Looks like a healthy filling recipe. Great to have this recipe now, trying it for tomorrow as I have some kidney beans in the pantry. We loooove Creole food and also a big fan of beans. I'll definitely going to try this next as soon as I get some red beans. I agree with beans are rice are always best combo I make spiced curried beans and rice, Your version of this red beans looks perfect. I love creole seasoning a lot after Indian spices. So I will give this recipe a try. Seeing thought I am from Haiti, this dish definitely is after my own heart. I absolutely love beans and rice. Your recipe sounds delicious!!!!!!!! This looks delicious! Saving for later! The combination of rice and beans are like match made in heaven ;) looks super delicious and inviting! Beans + rice is always the best combo as my family is a big fan of beans plus the creole seasoning. I can't wait to try this at home. Cravings are kicking in now. I love andouille! This sounds really fantastic! The ham hock must add a ton of flavor to this dish! Though it sounds humble, rice and beans, it is so packed with deliciousness! Yum! I just made red beans and rice last week! This really looks yummy. Beans is one of my favorite curry/dish. Another of your delicious dishes. Looks so complete and filling to me. Thanks for the detailed recipe. I love red beans and rice especially when it is cold outside. It is so filling. I'll give your recipe a try. You're a hero. Whenever I search for recipes, I look at the preparation time first. I really want to try the dishes that are easy to prepare. I'm going to prepare this for dinner! Kidney beans have high protein content. To such an extent that it can fill in as an incredible substitute for meat for vegans. At the point when overwhelmed by rice or entire wheat pasta, it gives an increase in protein to the body without the additional calories of meat or substantial dairy items. I am red kidney beans supplier that’s the reason I know the mostly benefits of red kidney beans.